Three weeks ago I contacted the Environment Agency to express my concerns regarding the falling water level in Widewater Lagoon. I was told that I would be contacted shortly by an Environment Agency Engineer. I have now received a call from an EA Engineer who during our conversation said that he was intending to see the water level for himself. As I was working from home I asked to meet him at the western causeway. He was surprised, possibly shocked at the low water level he saw. 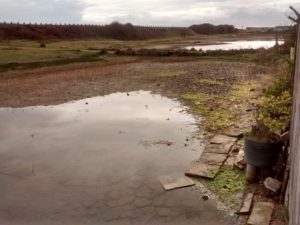 He told me that the weir boards have now been removed and the gate will be left open during the next two weeks when the tide is at its highest, he hopes this will go some way towards replenishing the water level. The mitigation pipe was cleared last year at a cost of £10,000, I warned, that in my opinion, the pipe is close to being blocked once more. I asked him to look at the flow of water once the gate is opened as my fear is that the water is blocked by a build-up of sand where the water enters the lagoon. The EA’s responsibility ends at the exit point of the pipe where it enters the lagoon so clearance may be our responsibility, however, having seen the strength of the flow last year it should clear itself.